If you are a small business owner, you need to have a business account to handle your finances. Whether you have money to put into your small business, investors or very little money, you need a bank for security and possible loans in the future. In the instance you do not have a lot of funding to put into your business to start, there are the options of larger banks or smaller banks and credit unions with no-fee options. It is important whether you are a sole proprietorship or LLC, that you have your bank account for your business because your bank account for your business needs to be separate than your bank account you hold personally. If not, you will have an accounting headache when taxes come around in April. Your business bank account protects you from liability. It is important to take time to analyze the different perks banks offer small businesses. 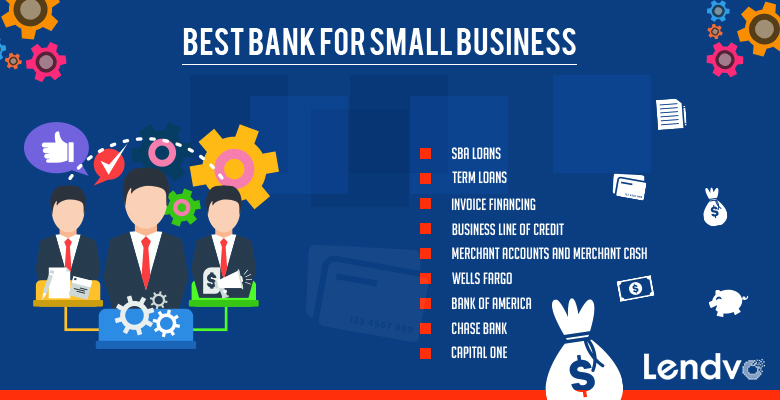 In order to find the right bank for your small business, it is important to put the time and effort in since this is a significant decision and hopefully a good working relationship you will be building that will last for a very long time. Granted, you may be a very busy small business owner so we put together a guide for you to evaluate for yourself rather than spending hours researching yourself. Things to take into account are fee structure, terms which are intimately related to the fee structure, and service which ranges from whether or not the bank is located at a convenient location to you, if the service is good, how customizable the accounts are and whether they are available when you need them most. An SBA loan is a long-term, low-interest small business loan partially guaranteed by the government. General qualifications are that your business has been around for 2 or more years, your credit score is above 640 and annual income above $100,000. SmartBiz is a unique way to apply for these small business loans. The loans range from $5,000 – $5 million and have loan terms ranging from 5-25 years and interest rates that start at 6.5%. You can get the loans in as little as three weeks. The pros are that they are suitable for a wide range of businesses with reasonable interest rates, low down payments and long payment terms while suitable for a wide range of business purposes. Downsides are they have lengthy paperwork, longer approval times and often may require collateral. Term loans are traditional term loans that come in lump sums of cash that you pay back with interest over a fixed period of time. For these you need to be in business for 2+ years, have a credit score of 620+ and $75,000 in annual revenue. These loans are usually bank products but there are a lot of online lenders like Bond Street, Funding Circle and Lending Club that provide longer-term loans at great rates. Short-Term Loans are similar to traditional term loans because you pay the money back with interest with daily or weekly payments anywhere from 3 to 18 months. You need to be in business for 6+ months, have a credit score of 500+ and $100,000 in annual income to qualify. Interest rates start at 10% with loans ranging from $2,500 – $250,000. These are exclusively applied to online at companies like Direct Capital, Quarterspot and OnDeck Capital. Invoice Financing is another option banks offer that lets you get paid for invoices you have outstanding, for a fee. You need to have $50,000 in annual revenue and be in business for 3+ months. These are usually found online at companies like BlueVine, Fundbox and Triumph Business Capital, not at traditional banks. A business line of credit is a bit differed from a short-term loan or SBA because it offers flexible “revolving” capital and serves almost like a credit card would, except it does so with cash. $50,000 or more is required in annual revenue and you must be in business for 6 or more months to qualify. Bluevine and Kabbage offer services like these. Merchant Account or High-Risk Merchant Accounts are other options offered by banks are other lending options. The merchant cash advances traditionally are offered if you are in business for over 5+ years with $75,000+ in annual revenue, a 400+ credit score and are commonly provided online through financing companies. Since they are the most expensive product they require the lowest credit score. Wells Fargo has a large array of business banking offerings that focus largely on small business lending. So, if you do own a small business and are looking for a loan, Wells Fargo is a very good option we recommend to our customers. They also offer four different low-cost business checking accounts. Wells Fargo also offers a Business Plan Center that helps those new to the world of small businesses to interactively plan their business plan and learn more about the future they face. They offer information on business permits, legal structures, transition strategies, organizational structures, market analysis, plans and more financials. Wells Fargo also offers a business account for larger business accounts that offers commercial financing, commercial insurance, corporate trust services, investing advice, retirement and employee benefits as well as international services. The four business checking accounts at Wells Fargo are simple and to the point. For $14 per month on the Business Choice Checking program you get 200 transactions and you can deposit anywhere up to $7,500 per month. $50 will allow you to open the account. The monthly fee can be waives if you have $7,500 in the account and 10 or more business debits or payments from the account or using some of the banks other services. Also available for smaller businesses is the Simple Business Checking account that requires a lower minimum-balance limit of $3,000. Then, if you use QuickBooks, you get a discount of $10 per month from the $25 it would usually cost. In May of 2016, Wells Fargo launched an initiative for small businesses which is a short-term loan approval program meant to appeal to small businesses with a focus in New Jersey. Unfortunately, this is only offered to small business clients who have a one-year relationship with the bank. Convenient, faster loans were the incentive for Wells Fargo offering this business plan. The offering comes as a one-year term loan of $10,000 to $35,000 with annual interest rates ranging from 14 to 23 percent. Rates start at 7.5% for small business owners to get a loan of $10,000 to $100,000 and they offer a range of loans including medium-term loans, lines of credit, short-term loans, SBA loans and equipment financing. Wells Fargo issued 6,587 loans from the 7(a) loan program in 2016 totaling $1,363,161,110 making them one of the most well-established loan programs. Bank of America is a reputable bank and they offer a variety of options for small business checking accounts and loan programs. Bank of America offers text alerts. They have two small business checking accounts that are the Business Advantage and Business Fundamentals accounts. Bank of America has supported more than 3 million small business owners. One of their current offers is for a $200 statement credit on a business credit card for members who enter $1000 into their account within the first month. This card also provides members with 1% back on purchases, 2% at restaurants, 3% at gas stations and office supply stores. Their customer support is available 24/7 and security tools are the top of the line. a business debit or credit card while having a monthly balance above $5,000 and a combined average of linked accounts of $15,000 with a min. balance of $3,000. Chase Bank prides itself on being a customer-focused bank, but its business banking sector has a lot of positives as well. Their merchant services division is impressive and offers customers several ways to secure convenient payments and conduct their business. This allows businesses with Chase to accept credit card processing rates starting at 2.75%. Their customer support team is available around the clock, 24/7 and they accept debit and credit chip cards, even offering a chip-enabled card reader once you sign up for your merchant services account. Chase then offers two types of business account credit cards. Chase Ink Cash APRs range from 13.49% to 19.49%. The Chase Ink Business Preferred is the other credit card they offer which comes with a $95 annual fee and no foreign transaction fees. The interest rate on this card is a variable APR of 16.74% to 21.74% on purchases and balance transfers. Chase has over 5,000 branches and 16,000 ATMs across 85 countries worldwide. Chase offers a Chase Total Business Checking account which comes with a monthly service fee ranging from $10-$12 that can be waived for $1,500 minimum as your daily balance. There are no outgoing international wire transfers, but they offer incomng and outgoing domestic wire transfers. The maximum amount of cash deposits and withdrawals allowed each month is $50,000 in addition to 200 transactions per month allowed with no fee and $7,500 allowed in cash deposits per month without being charges a fee. Another option is the Chase Performance Business Checking account which comes with a monthly service of $20 that is waives if you minimum daily balance in your bank account is $50,000. This comes with 350 transactions per month with no fee, same for $20,000 in cash deposits while allowing you two domestic wire transfers per month with no fee and domestic and international incoming and outgoing wire transfers. The Chase Platinum Business Checking account comes with a monthly service of $95 which is wiped when you have $100,000 minimum daily balance. 500 transactions are allowed per month with no fee and the same goes for $25,000 in cash deposits. Four outgoing wire transfers for month with no fee that is a bit more than the latter. Like the other business checking accounts, incoming and outgoing wire transfers are available domestically and internationally. Chase offers several perks for business account holders including Chase Business Associate debit cards which allow the small business owner to give their employee(s) a credit card if and as needed which is often the case with travel or taking clients out on the town. It allows your employees to make worry-free, quick and safe purchases with daily limits for point-of-sale purchases and ATM withdrawals. Secure lists of employee purchases are itemized by Chase and send the thw owner of the account with the monthly Chase Business checking statement. With this, you can save time by not having to make and approve every purchase; for security, the employee has to provide the employee’s legal name, date of birth and residential address. Another service Chase offers is the Chase Business Employee Deposit cards which give employees who make deposits for the business the ability to do so at ATMs, saving the time of standing in line. While it gives this privilege, employees still cannot withdraw, purchase or access financial information nor make changes to the account. Signer has to provide employee’s legal name, date of birth and residential address when in use. Payroll services are also offered through Chase Bank’s business program. Thi sis a quick, efficient and secure way to pay any sort of employees your small business may have as it deposits paychecks directly into your employees account no matter which financial institution they may use. Capital One prides itself on its Spark Business Account which offers unlimited checking or basic checking. With Spark Business Basic checking, you have access to unlimited transactions each month and mobile/online banking. Additionally you have unlimited business transactions, a $15 monthly service fee, standard wire fees, and deposits up to $5,000 in cash allowed each month; after that it is $1 for every additional $1,000 depositted. The $15 monthly service fee can be waived with $2,000 minimum 30 or 90-day average balance or two additional eligible business products. With this service you can make mobile deposits and pay bills online. The Spark Business Unlimited Checking offers no fee for cash deposits, unlimited business transactions, first 5 domestic wires per month free, acess to 2 basic checking accounts and as many transactions as needed with no fees. The $35 monthly service fee is waivable with $25,000 minimum 30 or 90-day average balance or two additional elligible, business products. Spark Business Account offers the option of acquiring loans or lines of credit. You have the option, fi your small business needs it, to acquire working capital lines of credit which will provide you with the possibility of lending solutions to assist you in purchases from new computers to office space or other major expenses. Other things offered are equipment and vehicle loands, real estate term loans, business installment loans to help consolidate debt, or SBA 7(a) & 504 loans which are traditional. Savings accounts and cash flow calculators to analyze cash flow, wires, remote deposits and more are also available along with special offers and promotions based on the quarter. Their small business credit cards come as the Spark cashback reqards or Spark miles rewards card. The Spark cash back rewards card comes with a $500 bonus once you send $4,500 in the first month, 17.4% variable APR Rate then a charge of $59 after your first year and 2% cash back on all purchases. The Spark miles card comes with the same variable APR, 2 miles per dollar on purchases and a possible one-time bonus of $500 when you spend $4,500 within three months. Capital One business checking has one option and it has no monthly transaction fees or limits, no minimum balance requirements, monthly fees for Capital One or Allpoint ATMs. The business checking account also offers free electronic invoicing, photo check deposit, Spark Business savings to prevent overdraft and the handy Spark Business mobile app to manage your money. Next-day deposits are also available in addition to a free debit card. Choosing a bank for your small business is a big decision and is ultimately up to you. It is worth evaluating the fees, APR rates and offerings of the banks we have listed above based on what suits your small business’ needs at this point in time of your business’ life cycle.